“In 2002, on the shore of the Danube River, seven Catholic women broke tradition and sent tremors to the very foundation of the Church. That day, the Danube 7 were ordained as priests — an office not recognized as valid for women parishioners in the Catholic Church. In doing so, the septet started a movement that adherents say contests for nothing less than spiritual equality in forging a more inclusive church that reflects a 21st-century sensibility. It’s a fight not without supporters. Two years ago, a Quinnipiac University poll found that at least 60 percent of U.S. Catholics backed female ordination. It’s a controversial movement that touched down in Central Florida in January. 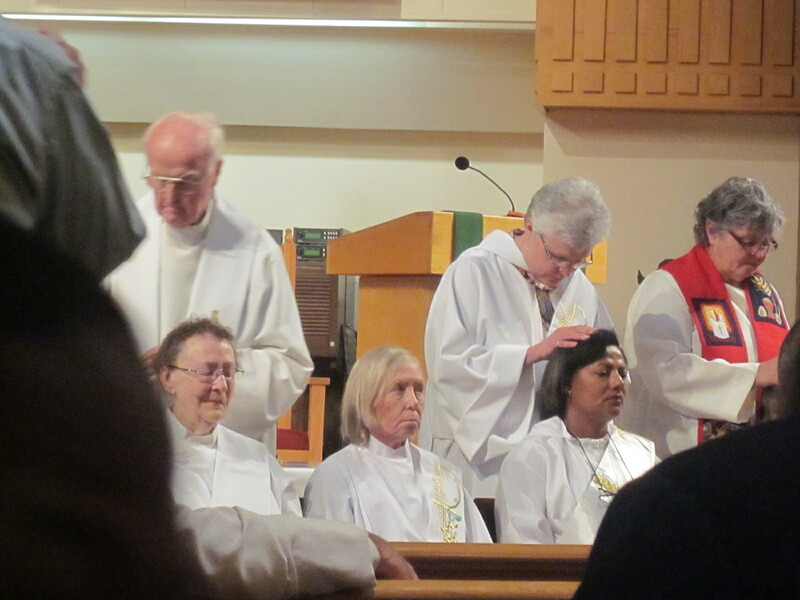 At Christ Unity Church in Orlando, the Association of Roman Catholic Women Priests ordained octogenarian Rita Lucey a priest. Supporters of ordaining women, including one of today’s columnists, contend that excluding women from the Roman Catholic priesthood not only is rooted in antiquated sexism, but also comes lacking any convincing biblical justification. Meanwhile, advocates say the status quo is reliant on faith, not fashion. The whims of changing eras have no bearing on God’s immutable word. And God, as today’s other columnist argues, clearly chose men to deliver his message and minister to his flock. Pink smoke may never rise from the Vatican. Nevertheless, women like Lucey continue to serve — fiat or no. We are called by God to bring forth our spiritual and creative gifts to inspire a spiritual and creative renaissance within the Roman Catholic Church. We are re-imagining the Church from its earliest beginning, deep in the taproot of the teachings of Jesus. We choose to follow the template of inclusivity and table community that Christ modeled. Everyone is welcome, including those on the margins of society, and those who have been excluded by the Church because of divorce, abortion, and sexual orientation. We draw our inspiration from the First Century communities that formed to celebrate and keep alive the Way of Jesus. These were the men and women whose hearts and minds were infused with his teachings. It was a sacred time when women were deacons, priests, and bishops as archaeological evidence demonstrates. The vision is to once again return the balance of feminine and masculine; working, creating, praying, and celebrating together. We create communities to support the evolution of “Kingdom” into “Kindom,” as kindred relations within the body of Christ. We are the people of God, the human family with all its glorious diversity and complexity. This is the renewed life-giving Church that encourages hope and welcomes possibility for the times we are living in. Pope Francis Welcomes Female Lutheran Archbishop, How About Catholic Women Priests? On Saturday, May 23 at 2 p.m. (Vigil of Pentecost) the Association of Roman Catholic Women Priests will ordain two priests and two deacons. The presiding bishop will be Bridget Mary Meehan of Sarasota. The ceremony will take place at St. Andrew United Church of Christ, 6908 Beneva Road in Sarasota, the home of Mary Mother of Jesus Inclusive Catholic Community. All are welcome. On April 29th Pope Francis defended pay equality, calling it “pure scandal” to pay women less than men. But when will the pontiff make women equal in the Church? Although Francis recently championed for women in more leadership roles in the church, on the issue of women’s ordination the door remains closed. However, the Good News is that the Association of Roman Catholic Women Priests is living Gospel equality now by ordaining women and men to serve inclusive Catholic liturgical communities where all are welcome to receive sacraments. lorocks@icloud.com 407.580.5448 of Casselberry, FL as a nurse and a chaplain has specialized in care for people with Hansen’s Disease, AIDS and dementia. She has also worked with the homeless in many areas of the U.S. and Thailand. “As a lifelong Catholic, I so often witnessed male priests who, due to lack of proper training, were unable to comfort people requesting sacraments. Then, as a chaplain to people with dementia, I found that I was able to be a ‘real priest’ for them. The beauty of the experience sunk into my soul. When I discovered the Women Priest movement, I knew immediately that I belong to it.” She hopes that as a Catholic priest she will be able to continue to bring those who feel disenfranchised into a welcoming community. Today we are observing the secular holiday known as Mothers’ Day. What’s this day all about? Most of us love Mothers’ Day either because we are a mom or we have—or had—a mom that we love or loved. Obviously, for those who didn’t grow up with a mom, or didn’t have a mom they loved or a mom that loved them, this can be a very difficult day to endure. As followers of Jesus, this day is not so much difficult to endure as it is uncomfortable because Jesus was not exactly a “family man.” He may have developed a good relationship with his mother by the end of his life, but early on in his ministry he may have been in conflict with his mother and his siblings. Mark’s Gospel suggests that his mother and siblings doubted his sanity, so he verbally replaces his biological family with his family of faith. For that reason alone, Mothers’ Day should make us feel a little uncomfortable. Nevertheless, other than the fact that the flower companies and card companies are making a lot of money today, this is a day that has become very important for many people. It is so much a part of our social fabric that we would do well to just “go with the flow” and keep celebrating it, although the Mothers’ Day of today looks very different from the original intent of Mothers’ Day. Originally, it was not a sentimental day of taking mom out for dinner and calling her to say how much you love her. Originally, it was socially important. It all started in the 1850s, when a West Virginia women’s organizer named Ann Reeves Jarvis, held Mother’s Day work clubs to improve sanitary conditions. Their intent was to lower infant mortality by fighting disease and curbing milk contamination. Later, during the Civil War, these Mothers’ Day work clubs also tended to wounded soldiers from both sides of the conflict. In the postwar years, Jarvis and other women organized Mothers’ Friendship Day picnics and other events as a way to unite former Civil War foes. One of these women, Julia Ward Howe, best known as the composer of “The Battle Hymn of the Republic,” issued a widely read “Mothers’ Day Proclamation” in 1870, calling for women to take an active political role in promoting a lasting peace. Around the same time, Ann Jarvis initiated a Mothers’ Friendship Day for Union and Confederate loyalists across her state. But it was her daughter, Anna, who was most responsible for what we call Mothers’ Day—and who would spend most of her later life fighting the sentimentalism of what Mothers’ Day has become. Well, that was a losing battle! There is no way to avoid sentimentalism where motherhood is concerned. There is no way to detach ourselves from the emotions that are part of the institution of motherhood. Even the fact that some people hate their mothers suggests that there is an emotional tie between mothers and their children, which lasts from the womb to the tomb. You can only hate what you can also love. I am a mom. I have three children and three step-children. I have two granddaughters and three step-granddaughters. I love the emotional connection I have with all of them, even when it feels more like a “love-hate” relationship. Whether my relationships with my children are good or strained, I know that I always have something I can pull out of my back pocket. And I’m not talking about my cell phone. I’m talking about a card—actually two cards. Like most moms I enjoy getting Mothers’ Day cards from my children—when they remember to send them. And yet there are two cards that I carry in my back pocket at all times and do not have to rely on anyone remembering to send them to me. I’m talking about the proverbial Love Card and Guidance Card. Mothers (and fathers) are born with these cards in their back pockets. They are always there when needed. Of course, it might seem to my children like I play the Guidance Card more than the Love Card. That’s probably because, on balance, they often need more guidance than love. By the way, guidance often looks like “discipline.” Some might even use the word “punishment,” although that word makes me cringe. I am convinced, however, that most parents play the Guidance Card with the Love Card. Together. At the same time. A good parent never tells her children what to do—she never commands them—without also assuring them that she loves them. This reminds me of the “Love Commandment” that we find in John’s Gospel. Jesus commands his “children” to love one another. This was his version of a Love Card, and if he had had proverbial pockets in his robes and tunics, he would have pulled out the Love Card from his back pocket on many occasions. Of course, Jesus must have had two pockets in his garb because he was never short on offering guidance either. If I read him correctly, Jesus played two cards in his ministry: A Love Card and a Guidance Card, and he always played them at the same time. Therefore, I believe what Jesus and other biblical writers are telling us is that everything we do must be accompanied by love. Even our efforts at guidance (which often looks like discipline), must be accompanied by love. On the other hand, expressions of love without some guidance are not beneficial for one’s offspring either. Showing love, but never offering guidance, advice, direction, or even discipline is not really very loving. Expressing love without ever informing a child what they should or should not do is, best case scenario, “spoiling,” and worst case scenario, negligence. Whether you are a mom or not, you have been dealt two cards—a Love Card and a Guidance Card. Use both of them, and use both of them together. That’s what Mothers’ Day is all about. The Community of Christ Sophia in Louisville, KY.